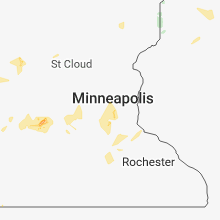 The Warsaw, MN area has had 0 reports of on-the-ground hail by trained spotters, and has been under severe weather warnings 17 times during the past 12 months. Doppler radar has detected hail at or near Warsaw, MN on 42 occasions, including 4 occasions during the past year. 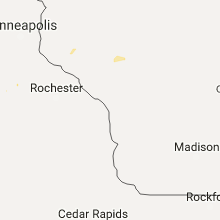 9/20/2018 6:52 PM CDT At 651 pm cdt, severe thunderstorms were located along a line extending from near castle rock to near northfield to ruskin to near owatonna to ellendale, moving northeast at 75 mph (law enforcement). Hazards include 70 mph wind gusts. Expect considerable tree damage. damage is likely to mobile homes, roofs, and outbuildings. 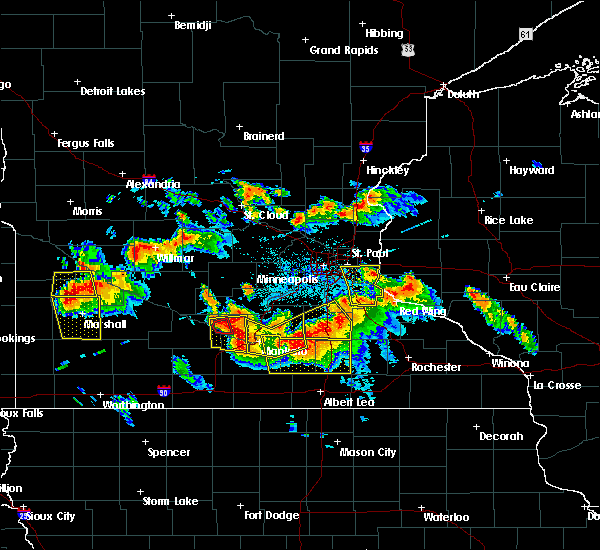 these severe storms will be near, northfield around 655 pm cdt. nerstrand around 700 pm cdt. other locations impacted by these severe thunderstorms include albert lea airport, lemond, myrtle, bridgewater, owatonna airport, clinton falls, merton, ruskin, faribault airport and manchester. A tornado watch remains in effect until 1100 pm cdt for south central and east central minnesota. 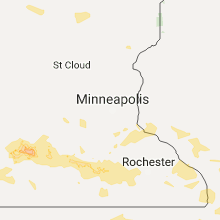 9/20/2018 6:40 PM CDT At 640 pm cdt, a severe thunderstorm capable of producing a tornado was located over medford, or 7 miles south of faribault, moving east at 70 mph (radar indicated rotation). Hazards include tornado. Flying debris will be dangerous to those caught without shelter. mobile homes will be damaged or destroyed. damage to roofs, windows, and vehicles will occur. tree damage is likely. this dangerous storm will be near, kenyon and nerstrand around 650 pm cdt. 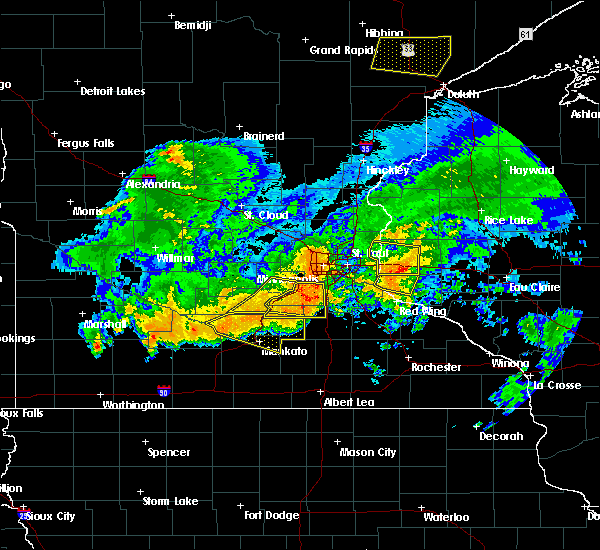 wanamingo around 700 pm cdt. pine island and zumbrota around 705 pm cdt. 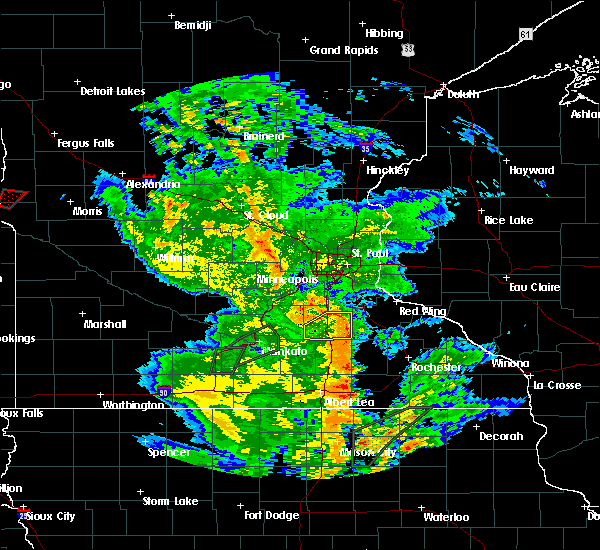 goodhue around 710 pm cdt. other locations impacted by this tornadic thunderstorm include clinton falls, bellechester, merton, ruskin, bombay, hader, owatonna airport and moland. This includes interstate 35 between mile markers 43 and 55. 9/20/2018 6:39 PM CDT At 638 pm cdt, a confirmed tornado was located over faribault airport, or near faribault, moving northeast at 65 mph (radar confirmed tornado). Hazards include damaging tornado. Flying debris will be dangerous to those caught without shelter. mobile homes will be damaged or destroyed. damage to roofs, windows, and vehicles will occur. tree damage is likely. this tornado will be near, northfield, dundas and nerstrand around 650 pm cdt. 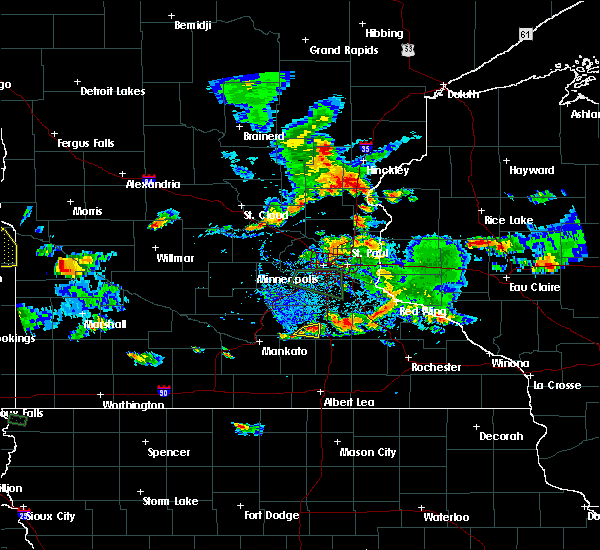 Other locations impacted by this tornadic thunderstorm include ruskin, faribault airport and bridgewater. 9/20/2018 6:31 PM CDT At 631 pm cdt, a confirmed tornado was located near waterville, or 11 miles west of faribault, moving northeast at 65 mph (radar confirmed tornado). Hazards include damaging tornado. Flying debris will be dangerous to those caught without shelter. mobile homes will be damaged or destroyed. damage to roofs, windows, and vehicles will occur. tree damage is likely. this tornado will be near, warsaw around 635 pm cdt. 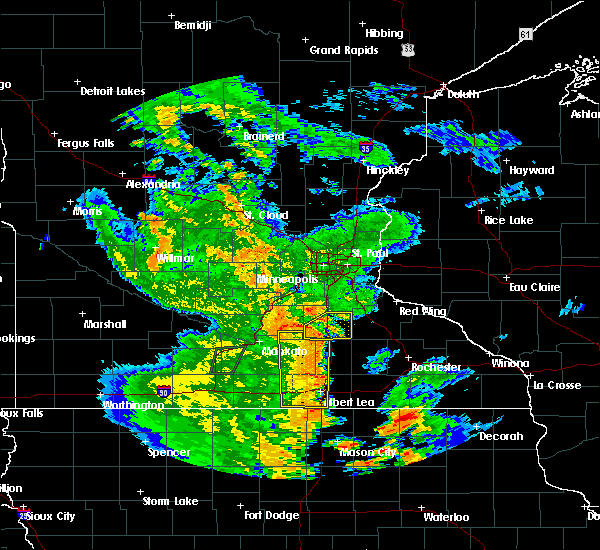 faribault around 640 pm cdt. northfield, dundas and nerstrand around 650 pm cdt. 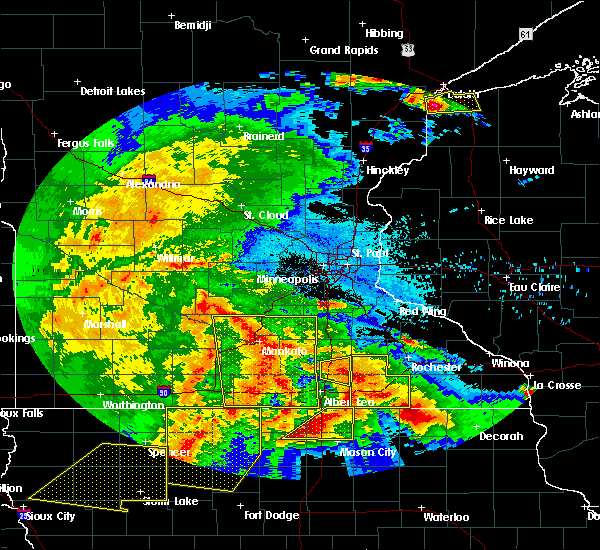 Other locations impacted by this tornadic thunderstorm include ruskin, faribault airport and bridgewater. 9/20/2018 6:26 PM CDT At 626 pm cdt, a severe thunderstorm capable of producing a tornado was located over waterville, or 17 miles west of faribault, moving northeast at 60 mph (radar indicated rotation). Hazards include tornado. Flying debris will be dangerous to those caught without shelter. mobile homes will be damaged or destroyed. damage to roofs, windows, and vehicles will occur. tree damage is likely. this dangerous storm will be near, morristown and warsaw around 635 pm cdt. 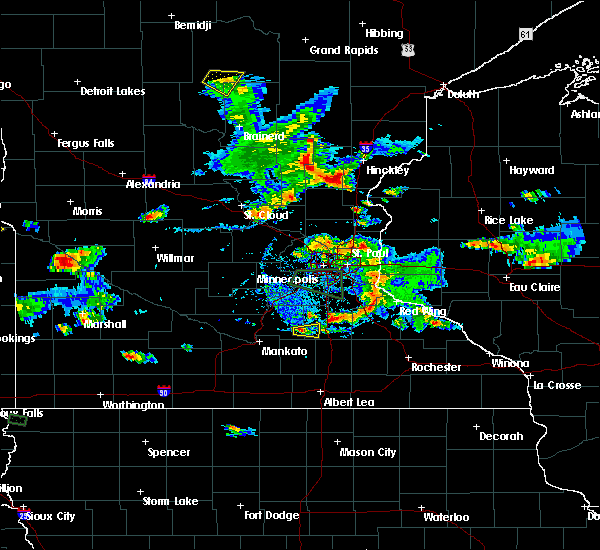 faribault around 640 pm cdt. dundas around 650 pm cdt. northfield and nerstrand around 655 pm cdt. 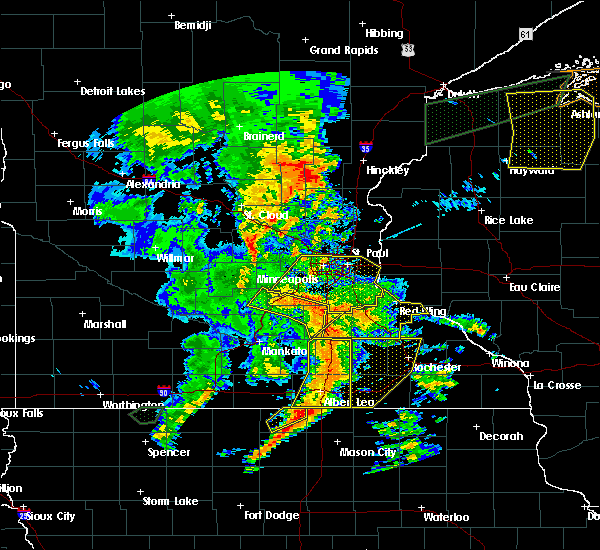 Other locations impacted by this tornadic thunderstorm include ruskin, faribault airport and bridgewater. 9/20/2018 6:23 PM CDT At 623 pm cdt, severe thunderstorms were located along a line extending from near lake jefferson to near janesville to near waldorf to near wells to near bricelyn, moving northeast at 75 mph (radar indicated). Hazards include 70 mph wind gusts. Expect considerable tree damage. damage is likely to mobile homes, roofs, and outbuildings. severe thunderstorms will be near, waterville and elysian around 630 pm cdt. 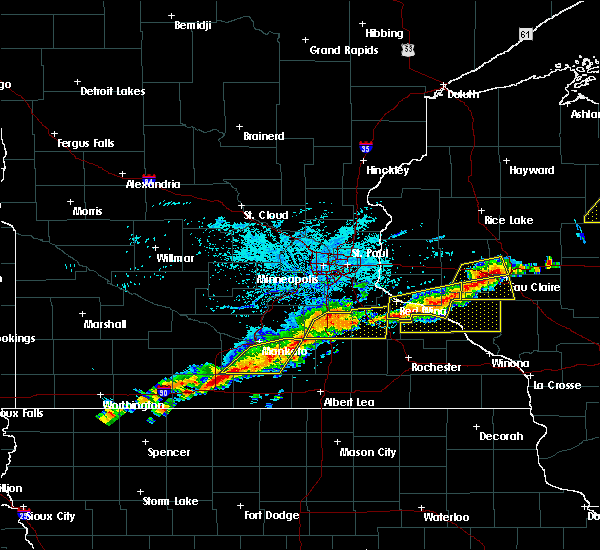 waseca, montgomery, new richland, morristown and warsaw around 635 pm cdt. 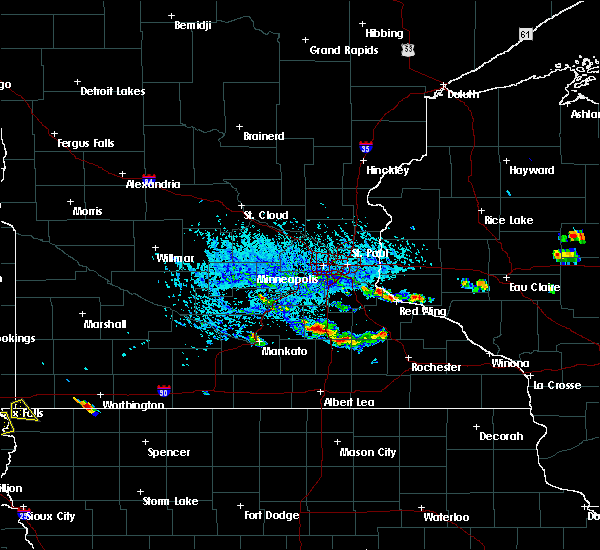 faribault and lonsdale around 640 pm cdt. webster, medford and clarks grove around 645 pm cdt. 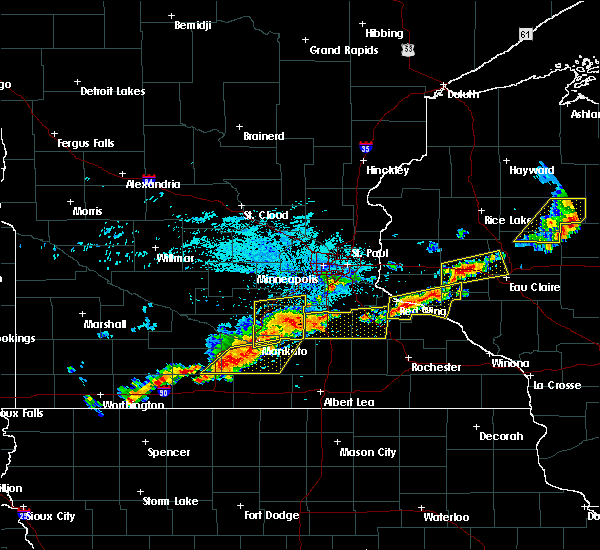 northfield, dundas, ellendale and geneva around 650 pm cdt. owatonna around 655 pm cdt. nerstrand around 700 pm cdt. A tornado watch remains in effect until 1100 pm cdt for south central and east central minnesota. 9/20/2018 6:19 PM CDT At 619 pm cdt, a severe thunderstorm capable of producing a tornado was located over janesville, or 13 miles east of mankato, moving northeast at 65 mph (radar indicated rotation). Hazards include tornado. Flying debris will be dangerous to those caught without shelter. mobile homes will be damaged or destroyed. damage to roofs, windows, and vehicles will occur. tree damage is likely. this dangerous storm will be near, waterville around 625 pm cdt. morristown and warsaw around 635 pm cdt. 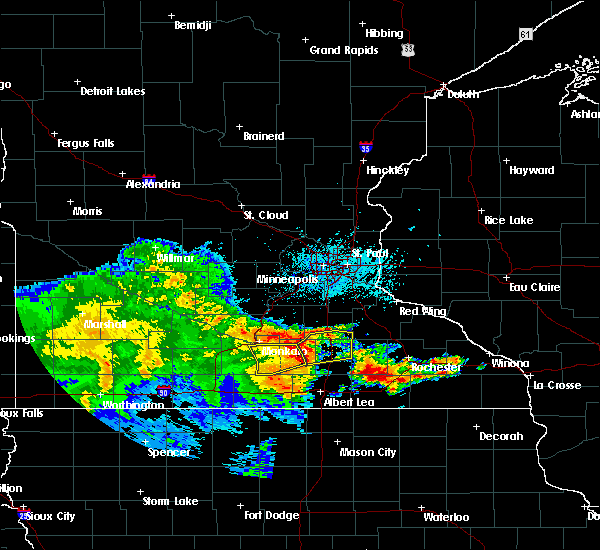 faribault around 640 pm cdt. northfield, dundas and nerstrand around 650 pm cdt. Other locations impacted by this tornadic thunderstorm include bridgewater, ruskin, faribault airport, kilkenny, smiths mill and greenland. 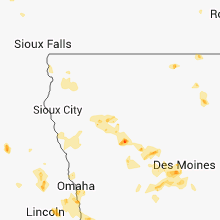 9/17/2018 2:32 PM CDT At 232 pm cdt, severe thunderstorms were located along a line extending from river falls to near nerstrand, moving east at 45 mph (law enforcement). Hazards include 60 mph wind gusts. Expect damage to roofs, siding, and trees. 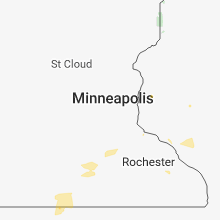 locations impacted include, faribault, northfield, red wing, woodbury, cottage grove, inver grove heights, hastings, rosemount, farmington, south st. paul, st. Paul park and prescott. 8/27/2018 5:09 PM CDT The severe thunderstorm warning for northeastern le sueur, eastern sibley, southwestern scott and northwestern rice counties will expire at 515 pm cdt, the storms which prompted the warning have moved out of the area. therefore, the warning will be allowed to expire. 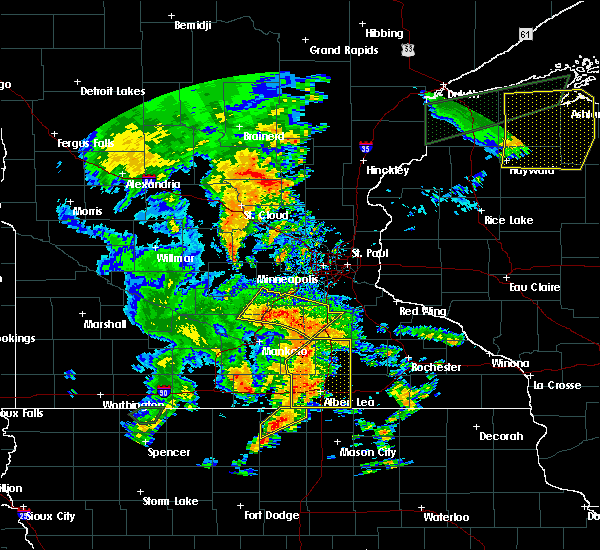 a severe thunderstorm watch remains in effect until 1000 pm cdt for south central, central and east central minnesota. to report severe weather, contact your nearest law enforcement agency. 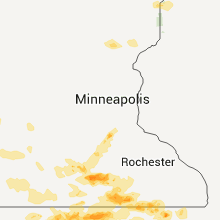 they will relay your report to the national weather service the twin cities. 8/27/2018 5:03 PM CDT At 503 pm cdt, severe thunderstorms were located along a line extending from near jordan to near dundas, moving northeast at 55 mph (radar indicated). Hazards include 60 mph wind gusts and nickel size hail. Expect damage to roofs, siding, and trees. 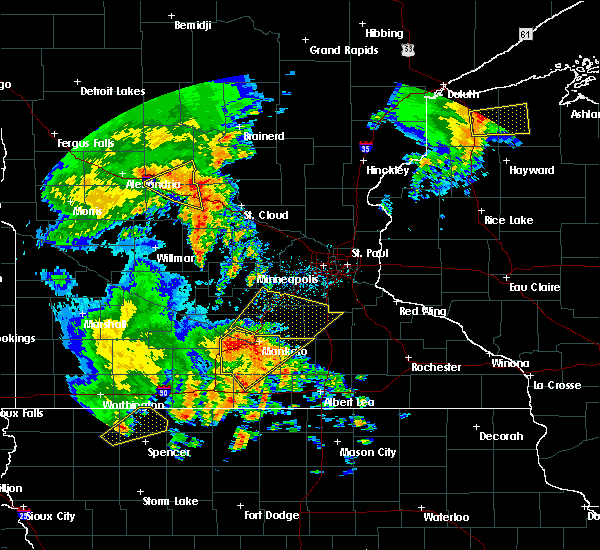 these severe storms will be near, northfield around 510 pm cdt. Other locations impacted by these severe thunderstorms include faribault airport, helena, bridgewater, veseli, heidelberg, new rome and st benedict. 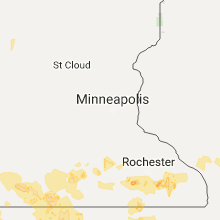 8/27/2018 4:50 PM CDT At 450 pm cdt, severe thunderstorms were located along a line extending from near st thomas to near faribault airport, moving northeast at 55 mph (radar indicated). Hazards include 60 mph wind gusts and nickel size hail. Expect damage to roofs, siding, and trees. these severe storms will be near, lonsdale around 455 pm cdt. new prague, webster and dundas around 500 pm cdt. northfield around 505 pm cdt. Other locations impacted by these severe thunderstorms include st thomas, rush river, bridgewater, st henry, norseland, faribault airport, kilkenny, helena, veseli and ottawa. 8/27/2018 4:39 PM CDT At 438 pm cdt, severe thunderstorms were located along a line extending from near ottawa to near kilkenny, moving northeast at 55 mph (radar indicated). Hazards include 70 mph wind gusts and nickel size hail. Expect considerable tree damage. damage is likely to mobile homes, roofs, and outbuildings. 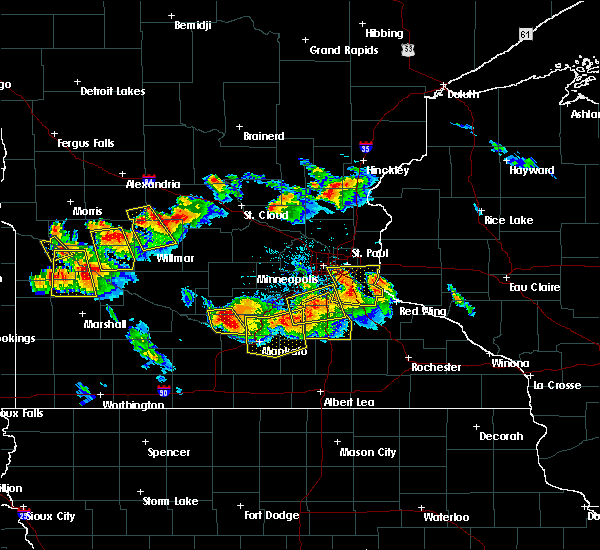 these severe storms will be near, faribault, morristown and warsaw around 445 pm cdt. belle plaine and lonsdale around 455 pm cdt. new prague, webster and dundas around 500 pm cdt. northfield around 505 pm cdt. Other locations impacted by these severe thunderstorms include st thomas, rush river, bridgewater, lake jefferson, st henry, norseland, oshawa, faribault airport, kilkenny and helena. 8/27/2018 4:14 PM CDT At 413 pm cdt, severe thunderstorms were located along a line extending from near judson to st. clair, moving northeast at 55 mph (radar indicated). Hazards include 70 mph wind gusts and nickel size hail. Expect considerable tree damage. damage is likely to mobile homes, roofs, and outbuildings. 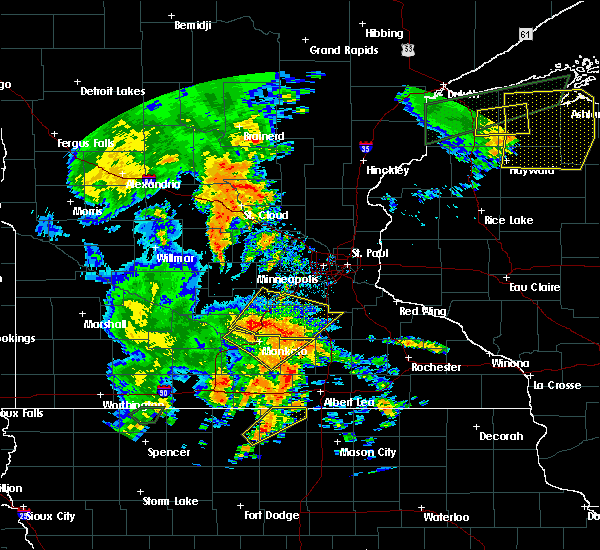 severe thunderstorms will be near, st. peter, kasota and elysian around 430 pm cdt. waterville and cleveland around 435 pm cdt. 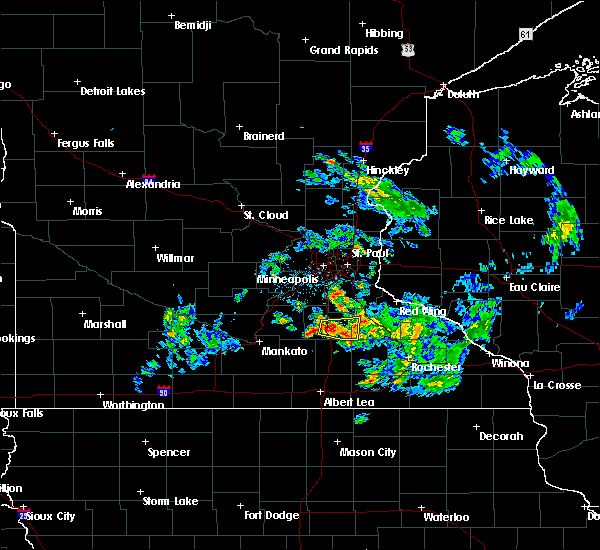 le sueur, morristown and warsaw around 440 pm cdt. 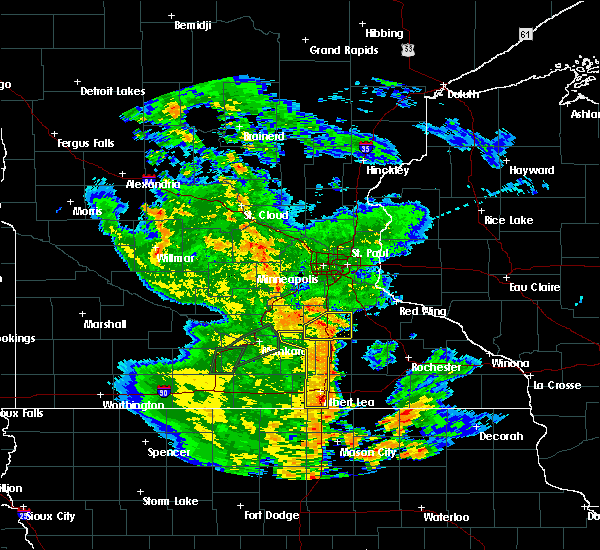 faribault and henderson around 445 pm cdt. lonsdale around 450 pm cdt. new prague and belle plaine around 455 pm cdt. Northfield, webster and dundas around 500 pm cdt. 5/24/2018 7:48 PM CDT At 748 pm cdt, a severe thunderstorm was located over faribault, moving northeast at 20 mph (radar indicated). Hazards include 60 mph wind gusts and quarter size hail. Hail damage to vehicles is expected. expect wind damage to roofs, siding, and trees. 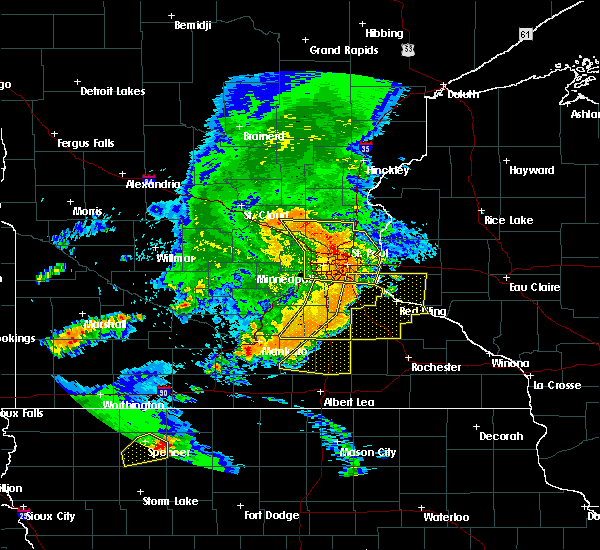 this severe thunderstorm will be near, faribault around 755 pm cdt. dundas around 820 pm cdt. nerstrand around 825 pm cdt. northfield around 830 pm cdt. 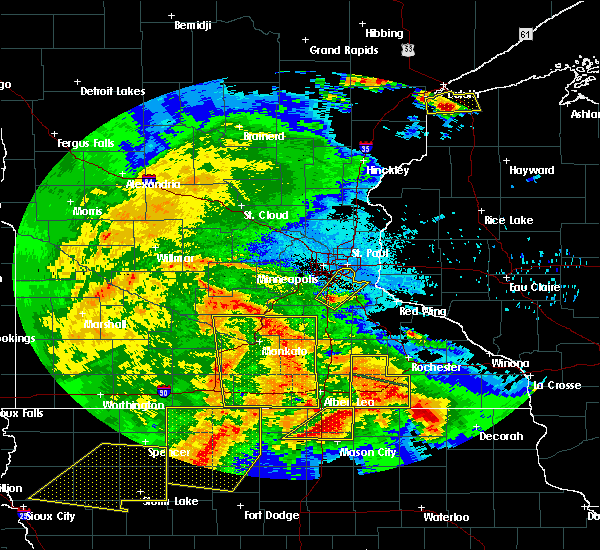 other locations impacted by this severe thunderstorm include ruskin, faribault airport and bridgewater. This includes interstate 35 between mile markers 51 and 66. 9/4/2017 5:44 PM CDT At 543 pm cdt, severe thunderstorms were located along a line extending from near nerstrand to near faribault to near waseca to near alma city, moving southeast at 50 mph (radar indicated). Hazards include 60 mph wind gusts. Expect damage to roofs, siding, and trees. severe thunderstorms will be near, medford around 550 pm cdt. owatonna around 555 pm cdt. new richland around 605 pm cdt. hartland around 610 pm cdt. clarks grove and ellendale around 615 pm cdt. blooming prairie and geneva around 620 pm cdt. Hollandale around 625 pm cdt. 8/1/2017 4:37 PM CDT At 436 pm cdt, a severe thunderstorm was located near warsaw, or near faribault, moving southeast at 25 mph (radar indicated). Hazards include 60 mph wind gusts and quarter size hail. Hail damage to vehicles is expected. expect wind damage to roofs, siding, and trees. 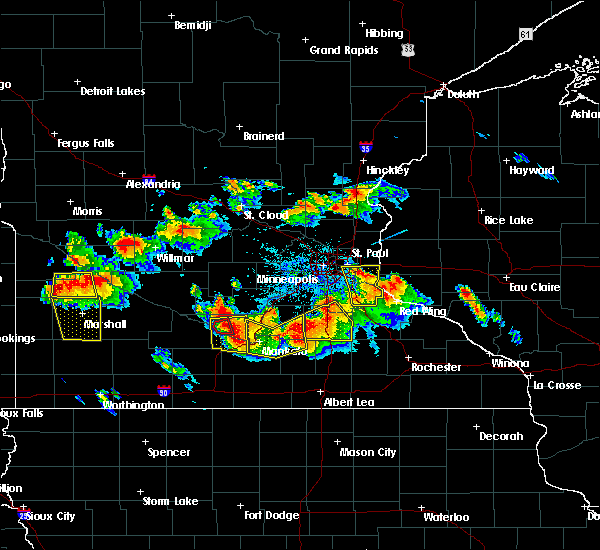 this severe thunderstorm will be near, faribault and warsaw around 445 pm cdt. morristown around 450 pm cdt. 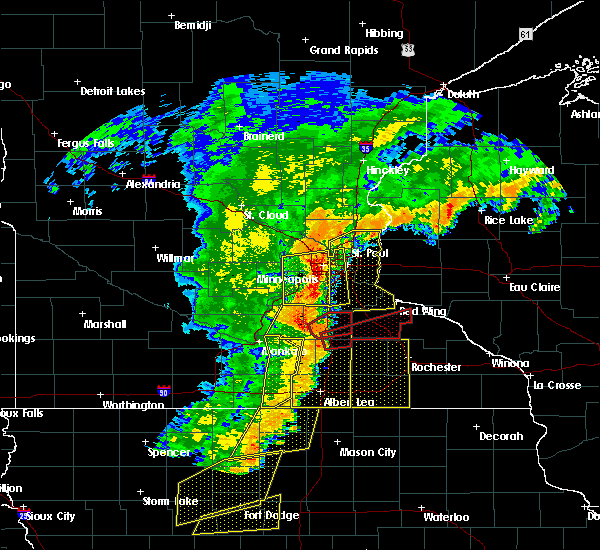 other locations impacted by this severe thunderstorm include deerfield, ruskin and faribault airport. This includes interstate 35 between mile markers 49 and 61. 7/25/2017 7:37 AM CDT At 737 am cdt, a severe thunderstorm was located over faribault airport, or over faribault, moving east at 25 mph (radar indicated). Hazards include 60 mph wind gusts and quarter size hail. Hail damage to vehicles is expected. expect wind damage to roofs, siding, and trees. this severe thunderstorm will be near, nerstrand around 805 am cdt. kenyon around 815 am cdt. other locations impacted by this severe thunderstorm include ruskin. This includes interstate 35 between mile markers 52 and 64. 7/9/2017 9:56 PM CDT At 956 pm cdt, a severe thunderstorm was located near medford, or near faribault, moving south at 25 mph (radar indicated). Hazards include golf ball size hail and 70 mph wind gusts. People and animals outdoors will be injured. expect hail damage to roofs, siding, windows, and vehicles. expect considerable tree damage. wind damage is also likely to mobile homes, roofs, and outbuildings. locations impacted include, faribault, northfield, dundas, morristown, warsaw, nerstrand, bridgewater, ruskin and faribault airport. 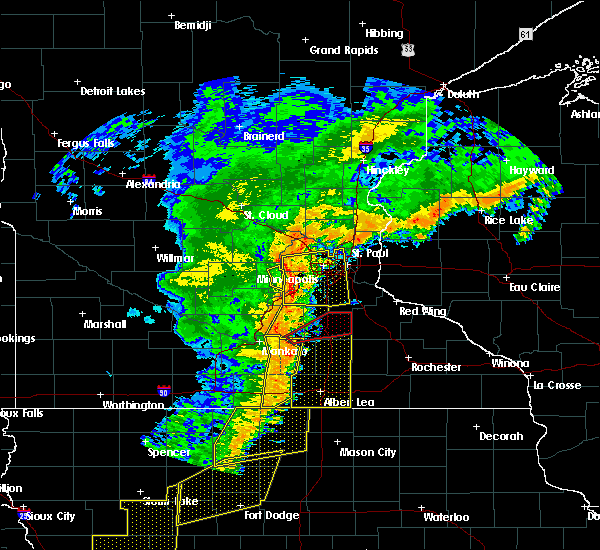 A tornado watch remains in effect until 100 am cdt for south central minnesota. 7/9/2017 9:43 PM CDT At 943 pm cdt, a severe thunderstorm was located over faribault, moving south at 25 mph (radar indicated). Hazards include golf ball size hail and 70 mph wind gusts. People and animals outdoors will be injured. expect hail damage to roofs, siding, windows, and vehicles. expect considerable tree damage. wind damage is also likely to mobile homes, roofs, and outbuildings. this severe thunderstorm will remain over mainly rural areas of southwestern dakota and rice counties, including the following locations: bridgewater, ruskin, castle rock and faribault airport. A tornado watch remains in effect until 100 am cdt for south central and east central minnesota. 7/9/2017 9:23 PM CDT At 923 pm cdt, a severe thunderstorm was located near lonsdale, or 9 miles northwest of faribault, moving south at 25 mph (radar indicated). Hazards include 70 mph wind gusts and ping pong ball size hail. People and animals outdoors will be injured. expect hail damage to roofs, siding, windows, and vehicles. expect considerable tree damage. wind damage is also likely to mobile homes, roofs, and outbuildings. 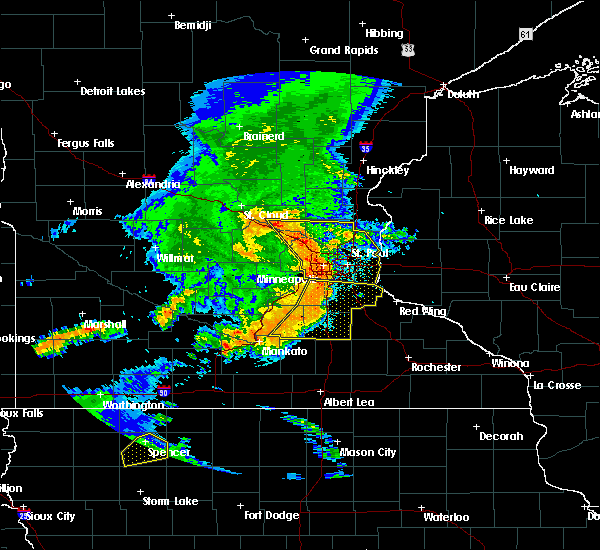 this severe thunderstorm will be near, faribault around 945 pm cdt. warsaw around 950 pm cdt. morristown around 955 pm cdt. other locations impacted by this severe thunderstorm include bridgewater, veseli, ruskin and faribault airport. this includes interstate 35 between mile markers 50 and 80. A tornado watch remains in effect until 100 am cdt for south central and east central minnesota. 6/22/2017 7:23 AM CDT At 723 am cdt, a severe thunderstorm was located over warsaw, or 7 miles southwest of faribault, moving east at 35 mph (radar indicated). Hazards include ping pong ball size hail. People and animals outdoors will be injured. expect damage to roofs, siding, windows, and vehicles. 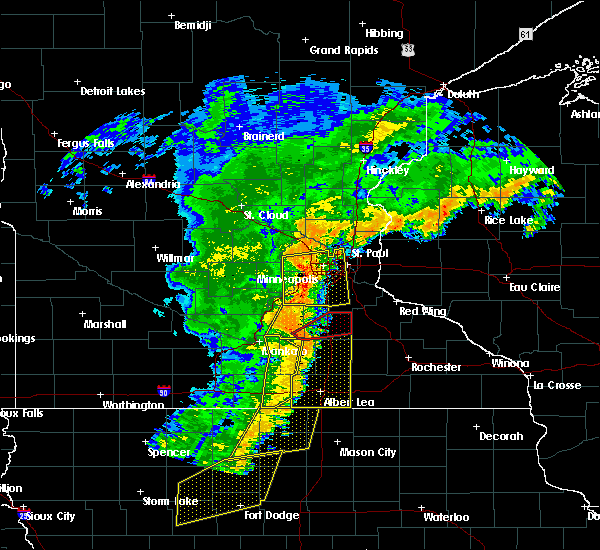 this severe thunderstorm will be near, faribault around 730 am cdt. medford around 740 am cdt. owatonna around 745 am cdt. other locations impacted by this severe thunderstorm include clinton falls, merton, deerfield, ruskin and moland. This includes interstate 35 between mile markers 46 and 56. 6/12/2017 1:24 PM CDT At 124 pm cdt, severe thunderstorms were located along a line extending from near waseca airport to near lemond to near new richland, moving northeast at 45 mph (radar indicated). Hazards include 60 mph wind gusts and penny size hail. Expect damage to roofs, siding, and trees. severe thunderstorms will be near, morristown around 135 pm cdt. warsaw around 140 pm cdt. 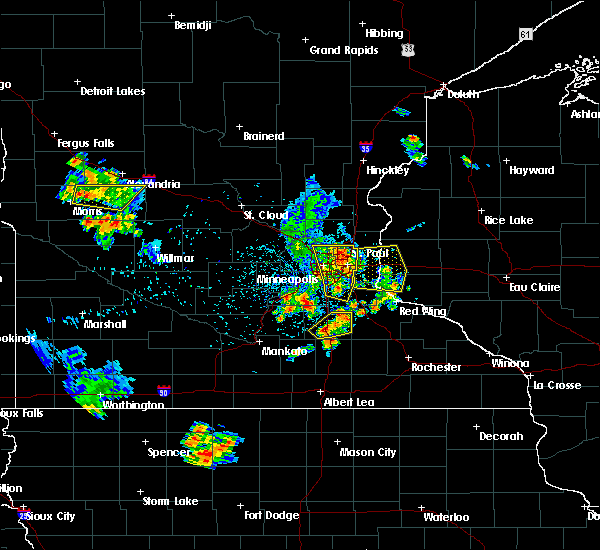 faribault and medford around 145 pm cdt. owatonna around 150 pm cdt. other locations impacted by these severe thunderstorms include clinton falls, waseca airport, lemond, merton, ruskin, deerfield, owatonna airport, hope and moland. this includes the following highways, interstate 35 between mile markers 35 and 55. u. s. Highway 14 between mile markers 158 and 182. 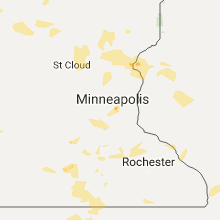 8/16/2016 6:39 PM CDT At 639 pm cdt, a severe thunderstorm was located near kilkenny, or 9 miles west of faribault, moving east at 15 mph (radar indicated). Hazards include quarter size hail. Damage to vehicles is expected. this severe storm will be near, warsaw around 650 pm cdt. Faribault around 705 pm cdt. 8/16/2016 6:21 PM CDT At 621 pm cdt, a severe thunderstorm was located over kilkenny, or 14 miles west of faribault, moving east at 15 mph (radar indicated). Hazards include 60 mph wind gusts and half dollar size hail. Hail damage to vehicles is expected. expect wind damage to roofs, siding, and trees. this severe thunderstorm will be near, morristown around 645 pm cdt. warsaw around 655 pm cdt. 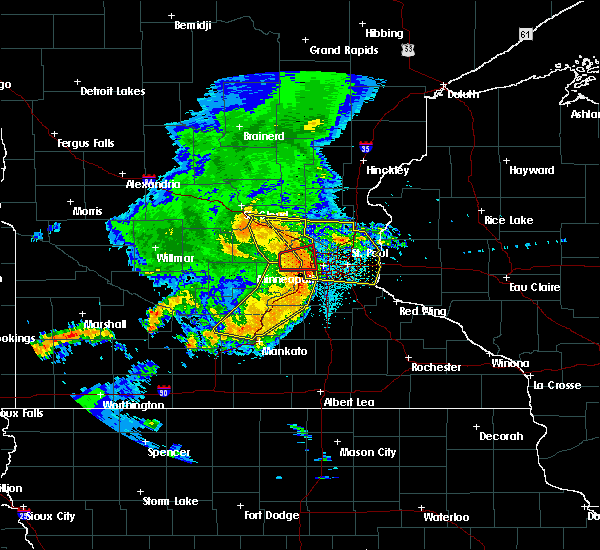 faribault around 710 pm cdt. Other locations impacted by this severe thunderstorm include kilkenny. 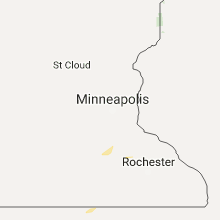 7/5/2016 8:08 PM CDT At 807 pm cdt, a severe thunderstorm was located near bombay, or 14 miles north of mantorville, moving southeast at 40 mph (public). Hazards include 70 mph wind gusts and quarter size hail. Hail damage to vehicles is expected. expect considerable tree damage. wind damage is also likely to mobile homes, roofs, and outbuildings. This severe thunderstorm will remain over mainly rural areas of south central dakota and southeastern rice counties, including the following locations: randolph and ruskin. 7/5/2016 7:20 PM CDT At 720 pm cdt, a severe thunderstorm was located over lonsdale, or 13 miles northwest of faribault, moving southeast at 40 mph (public). Hazards include 70 mph wind gusts and quarter size hail. Hail damage to vehicles is expected. expect considerable tree damage. wind damage is also likely to mobile homes, roofs, and outbuildings. this severe thunderstorm will be near, dundas around 735 pm cdt. northfield around 740 pm cdt. nerstrand around 750 pm cdt. other locations impacted by this severe thunderstorm include faribault airport, randolph, lakeville airport, ruskin, bridgewater and castle rock. This includes interstate 35 between mile markers 50 and 88. 6/14/2016 5:36 PM CDT The severe thunderstorm warning for rice county will expire at 545 pm cdt, the storm which prompted the warning has weakened below severe limits, and have exited the warned area. therefore the warning will be allowed to expire. a tornado watch remains in effect until 1000 pm cdt for southeastern minnesota. 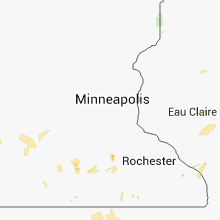 6/14/2016 5:16 PM CDT At 515 pm cdt, a severe thunderstorm was located over morristown, or 11 miles west of faribault, moving east at 35 mph (radar indicated. at 515 pm...damaging winds were occurring in waterville). Hazards include 70 mph wind gusts. Expect considerable tree damage. damage is likely to mobile homes, roofs, and outbuildings. this severe storm will be near, warsaw around 525 pm cdt. 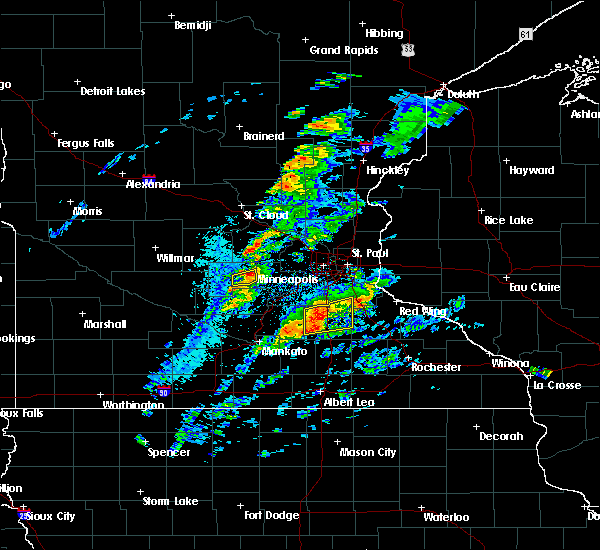 faribault around 530 pm cdt. northfield, dundas and nerstrand around 545 pm cdt. 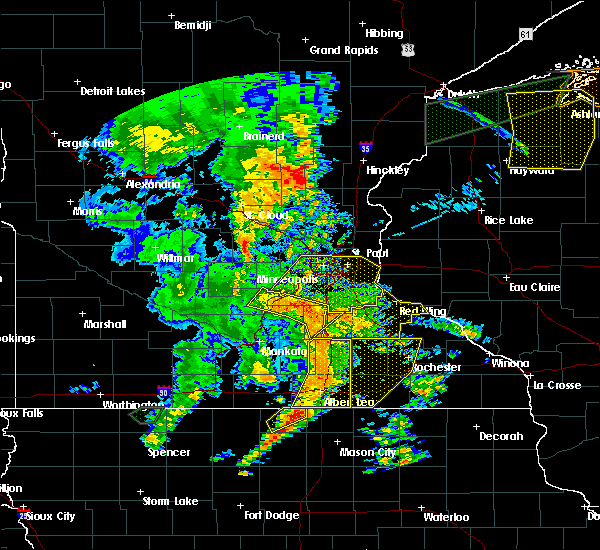 other locations impacted by this severe thunderstorm include faribault airport, ruskin and bridgewater. A tornado watch remains in effect until 1000 pm cdt for southeastern minnesota. 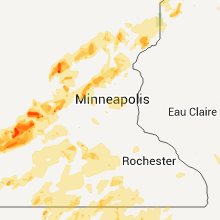 6/14/2016 4:56 PM CDT At 456 pm cdt, severe thunderstorms were located along a line extending from near kilkenny to morristown to near waseca, moving northeast at 40 mph (radar indicated). Hazards include 60 mph wind gusts. Expect damage to roofs. siding. and trees. severe thunderstorms will be near, morristown and warsaw around 500 pm cdt. 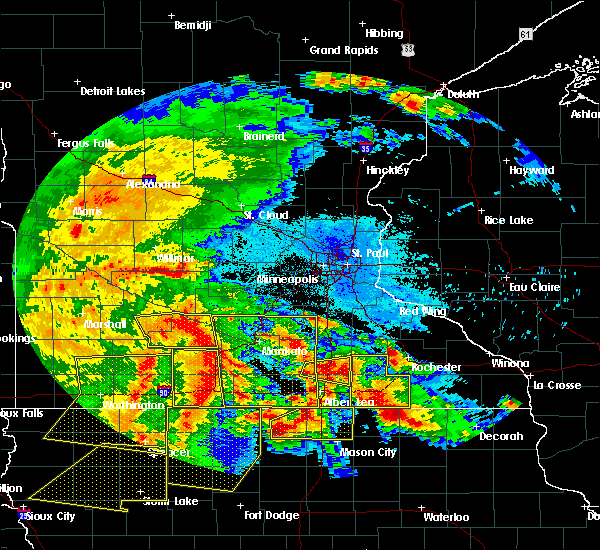 faribault around 510 pm cdt. nerstrand around 530 pm cdt. dundas around 535 pm cdt. northfield around 540 pm cdt. this includes interstate 35 between mile markers 50 and 69. A tornado watch remains in effect until 1000 pm cdt for southeastern minnesota. 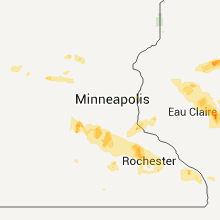 6/14/2016 10:56 AM CDT At 456 pm cdt, severe thunderstorms were located along a line extending from near kilkenny to morristown to near waseca, moving northeast at 40 mph (radar indicated). Hazards include 60 mph wind gusts. Expect damage to roofs. siding. and trees. severe thunderstorms will be near, morristown and warsaw around 500 pm cdt. 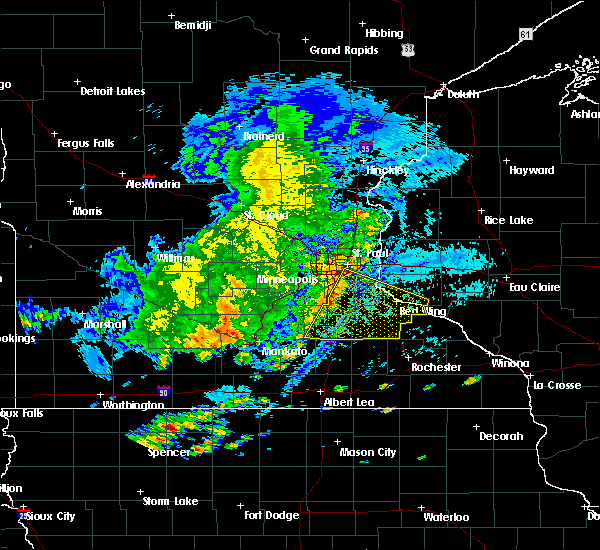 faribault around 510 pm cdt. nerstrand around 530 pm cdt. dundas around 535 pm cdt. northfield around 540 pm cdt. this includes interstate 35 between mile markers 50 and 69. A tornado watch remains in effect until 1000 pm cdt for southeastern minnesota. 6/10/2016 4:11 PM CDT At 411 pm cdt, a severe thunderstorm was located over faribault airport, or near faribault, moving east at 40 mph (radar indicated). Hazards include 60 mph wind gusts and penny size hail. Expect damage to roofs. siding. and trees. Locations impacted include, faribault, northfield, cannon falls, zumbrota, kenyon, dundas, stanton, wanamingo, morristown, warsaw, nerstrand and bridgewater. 6/10/2016 3:48 PM CDT At 348 pm cdt, a severe thunderstorm was located over kilkenny, or 15 miles west of faribault, moving east at 25 mph (radar indicated). Hazards include 60 mph wind gusts and nickel size hail. Expect damage to roofs. siding. And trees. 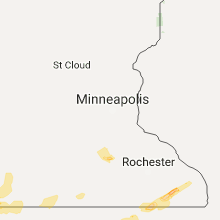 9/17/2015 3:55 PM CDT At 354 pm cdt, a severe thunderstorm was located near faribault airport, or 7 miles north of faribault, moving east at 20 mph (radar indicated). Hazards include 60 mph wind gusts and nickel size hail. Expect damage to roofs. siding and trees. this severe storm will be near, dundas around 410 pm cdt. northfield around 415 pm cdt. nerstrand around 430 pm cdt. 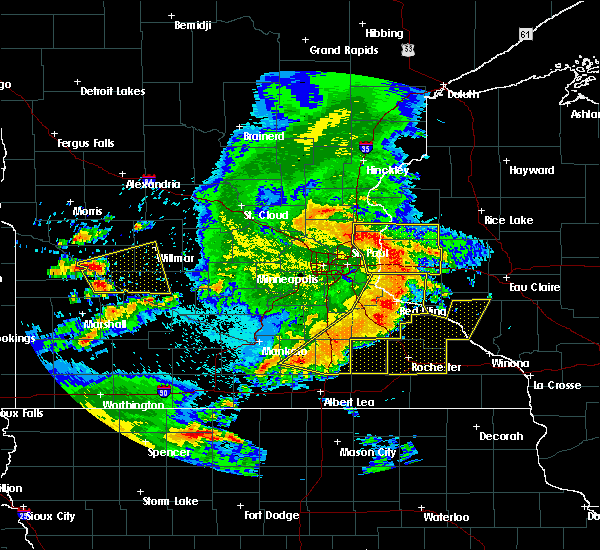 other locations impacted by this severe thunderstorm include faribault airport and bridgewater. This includes interstate 35 between mile markers 57 and 72. 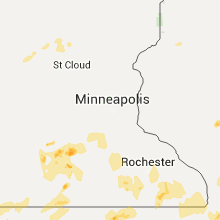 9/17/2015 3:43 PM CDT At 343 pm cdt, a severe thunderstorm was located near lonsdale, or 10 miles northwest of faribault, moving east at 25 mph (radar indicated). Hazards include 60 mph wind gusts and quarter size hail. Hail damage to vehicles is expected. expect wind damage to roofs, siding and trees. this severe thunderstorm will be near, dundas around 405 pm cdt. northfield around 415 pm cdt. other locations impacted by this severe thunderstorm include faribault airport, veseli, randolph, bridgewater and castle rock. This includes interstate 35 between mile markers 57 and 74. 7/18/2015 1:24 AM CDT At 124 am cdt, severe thunderstorms were located along a line extending from ellsworth to near mazeppa to near steele center, moving east at 50 mph (radar indicated). Hazards include 70 mph wind gusts. Expect considerable tree damage. damage is likely to mobile homes, roofs and outbuildings. 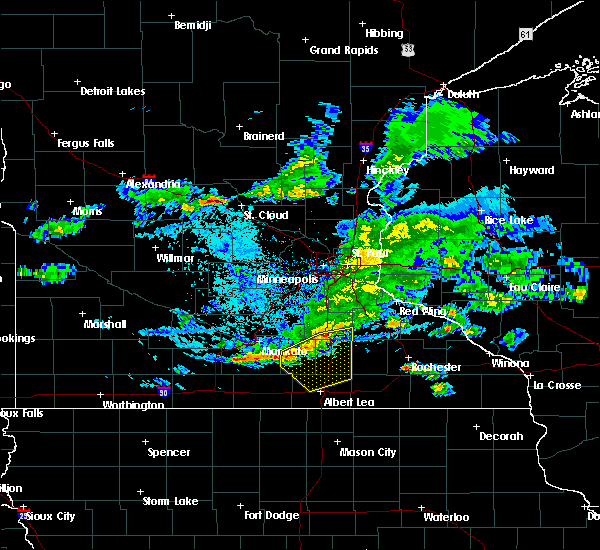 these severe storms will be near, ellsworth around 130 am cdt. Other locations impacted by these severe thunderstorms include lemond, frontenac state park, bixby, afton state park, owatonna airport, hader, clinton falls, diamond bluff, el paso and bellechester. 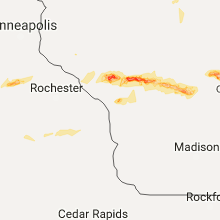 7/18/2015 12:55 AM CDT At 1254 am cdt, severe thunderstorms were located along a line extending from grey cloud township to near northfield to near waldorf, moving east at 45 mph (radar indicated). Hazards include 70 mph wind gusts. Expect considerable tree damage. damage is likely to mobile homes, roofs and outbuildings. 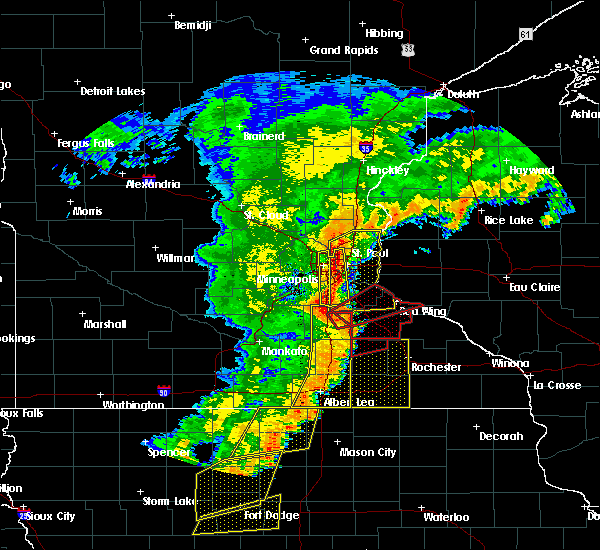 severe thunderstorms will be near, northfield, cottage grove, st. paul park, stanton and randolph around 100 am cdt. 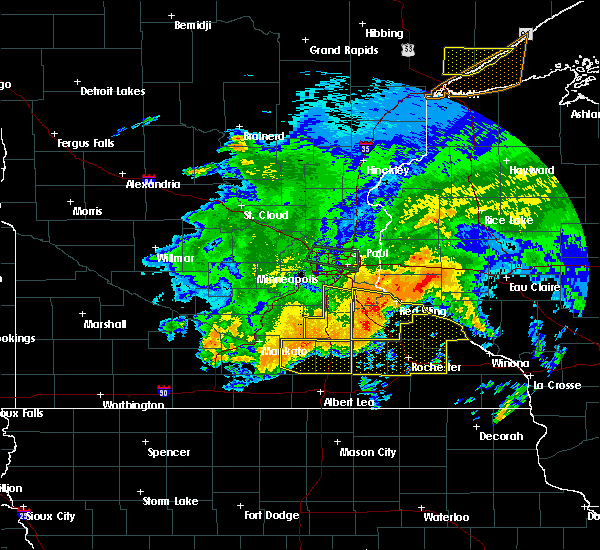 hastings and cannon falls around 105 am cdt. prescott around 110 am cdt. 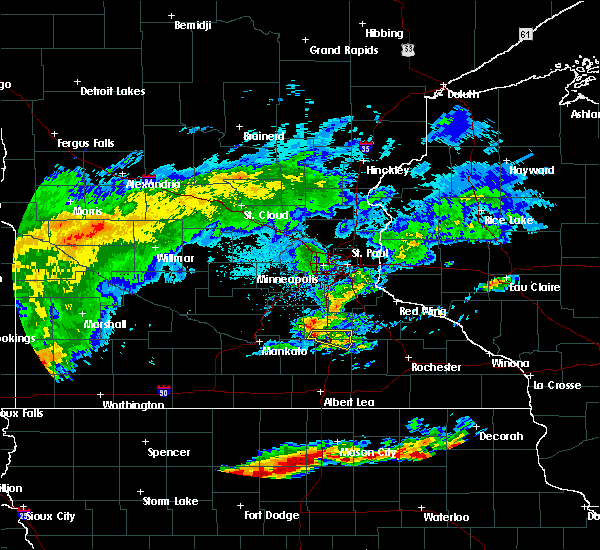 river falls and ellendale around 120 am cdt. 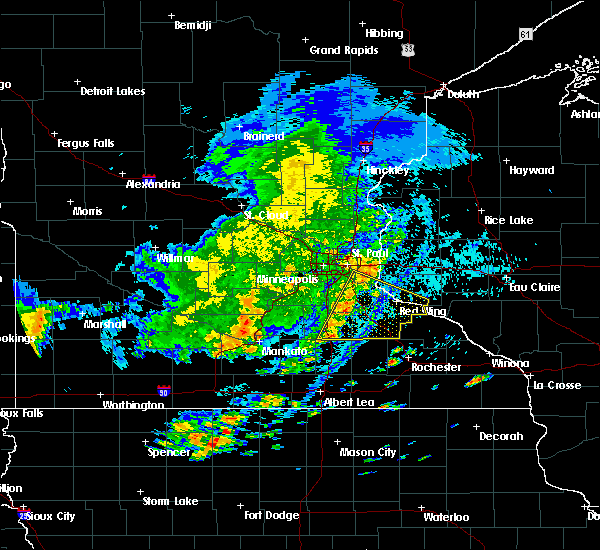 goodhue around 125 am cdt. ellsworth around 130 am cdt. blooming prairie around 135 am cdt. stockholm and frontenac around 145 am cdt. Other locations impacted by these severe thunderstorms include lemond, frontenac state park, bixby, afton state park, owatonna airport, hader, clinton falls, bridgewater, st paul park and diamond bluff. 6/22/2015 6:31 AM CDT At 631 am cdt, severe thunderstorms were located along a line extending from st thomas to near waldorf to near mansfield, moving east at 70 mph (radar indicated). Hazards include 70 mph wind gusts and quarter size hail. Hail damage to vehicles is expected. expect considerable tree damage. Wind damage is also likely to mobile homes, roofs and outbuildings. 5/25/2015 7:09 PM CDT The severe thunderstorm warning for southeastern rice county will expire at 715 pm cdt, the storm which prompted the warning has weakened below severe limits, and no longer pose an immediate threat to life or property. therefore the warning will be allowed to expire. 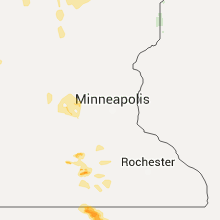 5/25/2015 6:52 PM CDT At 651 pm cdt, a severe thunderstorm was located over faribault, moving northeast at 25 mph (radar indicated). Hazards include 60 mph wind gusts and quarter size hail. Hail damage to vehicles is expected. expect wind damage to roofs, siding and trees. This severe thunderstorm will remain over mainly rural areas of southeastern rice county, including the following locations, faribault airport.